I can’t believe it is already the last day of September! I have had an action packed month to say the least what with festivities, school holidays, work and business development plus lots of Spring fun. Hope you’ve had an amazing month too. This month’s last post is the stylist’s accessory pick of the month paired with a trend I’ve been eager to try- the culotte pants! This month’s pick is the Blush & co necklace “Blush of simplicity”. 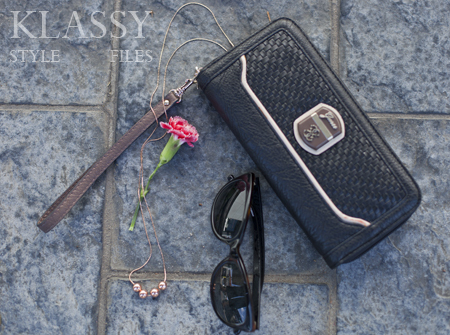 Just like it’s name I couldn’t help but pair this elegant rose gold accessory with a simple yet striking outfit. Stripes are always super chic and this time I teamed them with culottes and divine rose gold. I have been attracted to the Blush & co jewellery line ever since its early days. After looking at some of my favourite bloggers sporting different pieces, I was quite convinced I needed more than just one of their beautiful pieces. What also got me excited was the brand philosophy and the combination of some unique materials like glass pearls, Swarovski crystals and rose gold beads. Jacquie Arnold the gorgeous founder of Blush & Co has some serious creative talent and I love how she has grown the brand in a matter of months, inspiring indeed! Check out Jacquie’s interview here by Kimba. Blush & co offers a variety of jewellery for various occasions- work, party or relaxed weekend looks. They offer free shipping Australia wide and great customer service, what’s not to like?! When it comes to outfit styling I’m most influenced by the ‘less is more’ philosophy. One well tailored, perfectly fitted piece is extremely powerful not only in making your outfit look great but also raises your confidence super high. Culottes can be a tricky piece of clothing but finding a well fitted pair and teaming it with the correct top can add the WOW factor to your look. 1. A black and white combination will be an instant winner, think a silk tee with black culottes. Note: This is not a sponsored post. The opinions expressed here are my own based on my experience of my beautiful Blush & Co. purchases. The culottes look awesome! I’ve just ordered a flowy pair from Katies and can’t wait for them to arrive!